2018Featuring over 200 high-definition and breathtaking photographs and stills, this book brings the mysterious oceanic world to life. Take a deep dive into this iconic series with behind-the-scenes accounts of how the team captured stunning underwater footage over five years of work that included taking 125 exploring trips, visiting 39 countries and filming 6,000 hours underwater. Featuring over 200 high-definition and breathtaking photographs and stills, this book brings the mysterious oceanic world to life. 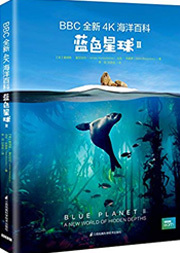 Voyages of migration show how each of the oceans on our planet are connected; coral reefs and Arctic ice communities are revealed as thriving underwater cities; while shorelines throw up continual challenges to those living there and passing through. A final chapter explores the science and technology of the ocean enterprise, revealing not only how the team was able to capture these amazing stories on film, but what the future holds for marine life based on these discoveries.